"Pretty" is a relative term. But, little Lena thinks it is gorgeous! Last week Jo-Ann had a big fabric sale and I let Lena pick out some fabric for a "dinosaur quilt". 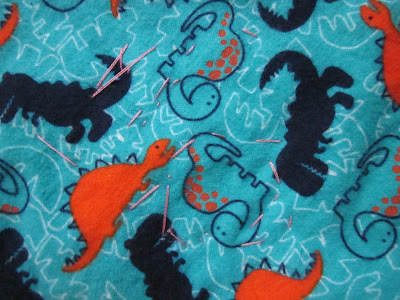 She picked out this boldly printed flannel of orange and navy dinosaurs on turquoise. It was THE fabric and none else would do. Saturday was spent making some curtains for the boy's loft bed, so Sunday was the day of the quilt assembly. 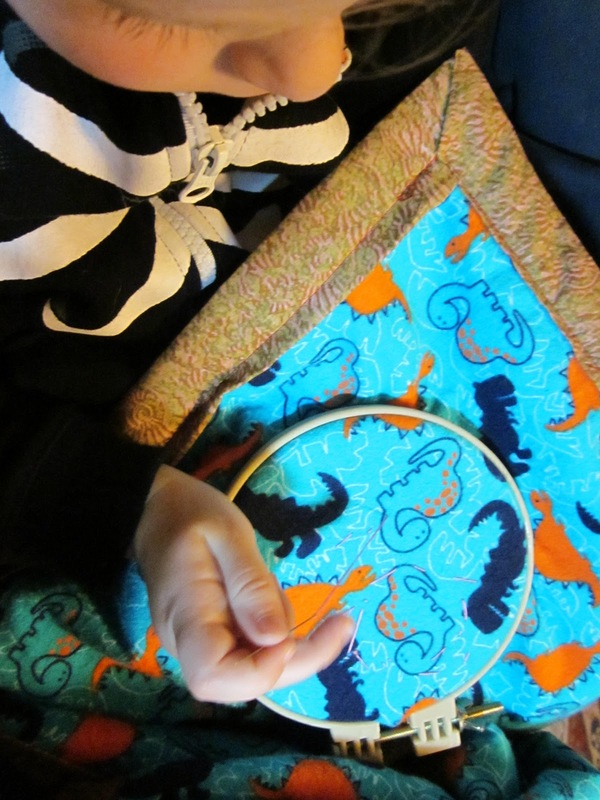 She picked out a pink ammonite fossil print cotton from my stash for the binding. None else would do, so despite a vividly bright and clashy color scheme, I assembled it. She "helped" by "measuring" the binding strips and laying them out as I cut them. Oh, and by getting into all the spools of thread to pick out the color I should use to sew them together (bright red). 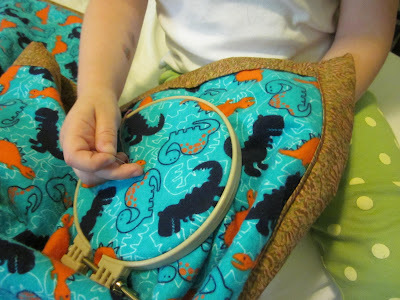 The original plan was to mount some of the stitched dinosaurs I'd made for her directly onto it, but when I went to get them she said "NO" and it took a long time to sort out what she wanted...eventually we figure out what she wanted was to do the decorative stitching on it herself. You might remember her first stitches from September. So I got out the pink DMC and a hoop and she went to town. She couldn't finish her masterpiece before it was time for trick-or-treating, so in the evening she cuddled up on the couch next to me to finish it. She loves it. If she wants to use this thing to learn some stitches that is fine with me, and she's been dragging it all over the house ever since. I am really glad my only requirement for the materials she picked out was that everything be washable--she wanted some gold sequins added too, but I said maybe next time.